Rivers, mountains and trails await year-round. Discover why Bend is the mountain town that has it all. From 16 breweries along the Bend Ale Trail, to over 500 miles of singletrack for hiking, biking or running, Bend is where you go to play. Plan your Bend Getaway today! It’s a pretty safe bet to keep your shades handy year-round in Bend. With 300 days of annual sunshine, blue sky, clean air and cool nights are sort of the way of life here. The broad spectrum of weather and landscape in Bend makes for surprises around every turn. There’s even an annual event called Pole Pedal Paddle (set for May 19, 2018), which combines alpine and nordic skiing at Mt. Bachelor with biking, running and a paddle down the sparkling Deschutes River. If you’re out of breath just thinking about it, don’t worry. You can pause and take it all in. 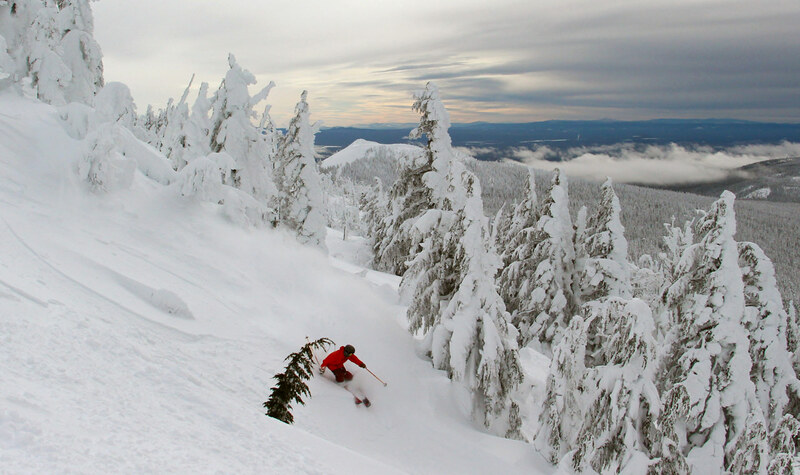 Here’s how to catch your thrills in Bend, no matter the season. The Deschutes River is popular partly for its beauty, partly for its accessibility — it meanders right through downtown Bend. Start at Riverbend Park, just beyond the Old Mill District. Here you can rent an inner tube, kayak or stand-up paddleboard from Sun Country Tours, Tumalo Creek Kayak & Canoe or another outfitter. Float or paddle for about two hours until you reach Drake Park (kids and newbies should take the detour before the Bend Whitewater Park’s whitewater channel), then board the city shuttle for a couple of bucks and do it all over again. About 30 minutes outside of Bend, you’ll find picturesque Tumalo Falls, where a quick half-mile round-trip hike leads to the main falls, a lovely spot for a picnic. You can also explore the larger 7.4-mile loop, which winds past half a dozen more waterfalls and smaller cascades. Dogs are welcome on the North Fork Trail as well as many other trails around Bend. Whenever you head out, remember to leave the site better than you found it: Pack out your trash (including pet waste), stay on trails, be mindful to other users, and practice other Leave No Trace principles. This tour may end up being your kids’ favorite activity of your entire trip. Located just 30 minutes south of Bend, the Paulina Plunge is a mountain bike route that lets you descend more than 2,000 vertical feet on fat tire mountain bikes. Along the way, you stop at six waterfalls — two of which are natural water slides — yes, water slides. Everything is provided for you — shuttles up the mountain, expert guides, bikes and helmets. Kids with beginner- to intermediate-level skills as young as 4 can ride, or age 4 to 8 can ride tandem. Hungry? 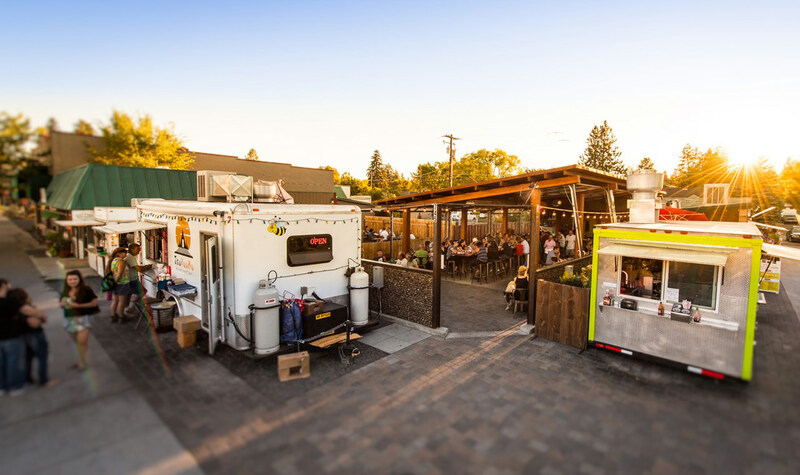 Soak up as much of that Bend sunshine as possible by heading to any of the city’s fine restaurants and brewpubs with outdoor seating, like Worthy Brewing Company, as well as the diverse array of food carts you’ll find around town. The Lot is a popular food cart pod located at the corner of Northwest Columbia Street and Northwest Hartford Avenue. If it’s raining outside, or too hot, go underground. Explore Bend’s lava tubes with Wanderlust Tours. This tour company has exclusive access to caves where others aren’t allowed. Dress warmly, as the temperature is a nippy 45 degrees. The tours are good for ages 5 and up — just make sure everyone’s OK with darkness and bat sightings. Head inside to Vector Volcano Classic Arcade in historic downtown Bend. This arcade offers old-school and modern arcade games like Frogger, Pac-Man, Q*bert and Donkey Kong Jr. for just $5 per hour, per visitor. The adults can kick back and sip a local Bend brew — but don’t be surprised if you find yourself hogging the machines. 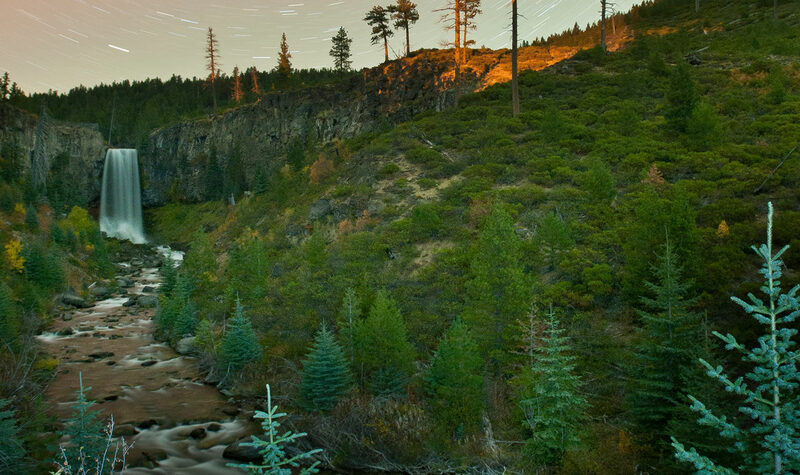 To see the wild side of Bend, head to the High Desert Museum, just five minutes south of downtown Bend. 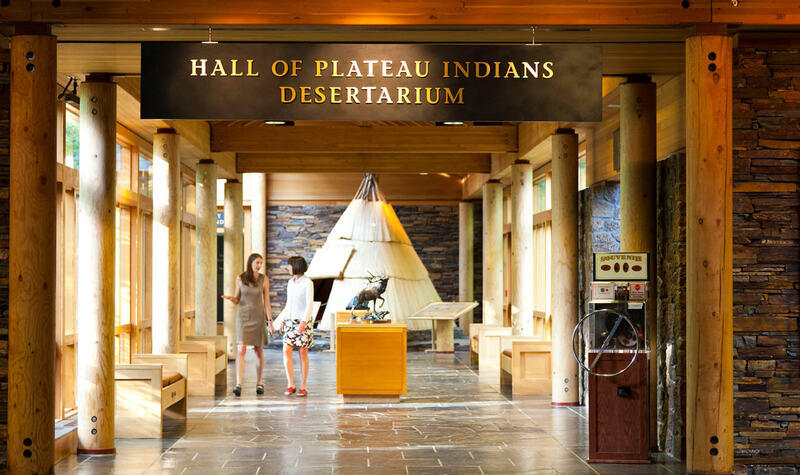 This hands-on museum explores the art, history, culture and wildlife that are unique to this area. You can see how the keepers feed the otters every afternoon and marvel as owls, hawks, falcons and vultures flying overhead during a twice-daily show. Do the kids still have energy in the tank? Take them to Mountain Air Indoor Trampoline Park, with its 50 connected trampolines. While it is open during the day, it makes for an especially impressive nighttime activity on Fridays and Saturdays when the lights dim and kids jump on glow-in-the-dark trampolines. With the recent opening of the Cloudchaser lift on the east side, Mt. Bachelor has become a skier and snowboarder’s paradise, with 4,318 skiable acres open November through Memorial Day weekend. Kids 12 and under ski free with parents. Après ski food and drink options on the mountain abound; also check out their summertime Sunset Dinner series at the summit. Not a fan of vertical drops? Try snowshoeing. Wanderlust Tours offers a one-of-a-kind Shoes, Brews & Views tour that takes you to little-known mountain viewpoints with the help of an expert guide, all gear provided, refreshing ales by Bend’s Cascade Lakes Brewery and root beer for the kids. Or, rent a pair of show shoes in town and go exploring on your own — there are hundreds of miles of easy-to-access trails just outside of town. Mt. Bachelor’s Snowblast Tubing Park is open Fridays through Sundays with three sessions per day, but they can sell out, so plan ahead. Or head to the sledding hill at nearby Wanoga Sno-Park. All you need is a sled and a Sno-Park permit on the dash of your car. Get ready for lots of joyful shrieks and maybe even some snowball fights. Best suited for young families (ages 3 and up), sign up for a sled dog ride. Meet your friendly canine team and then hop into a warm, cozy sled for a ride through the forest. All rides leave from the lower Sunrise Lodge parking area at Mt. Bachelor. 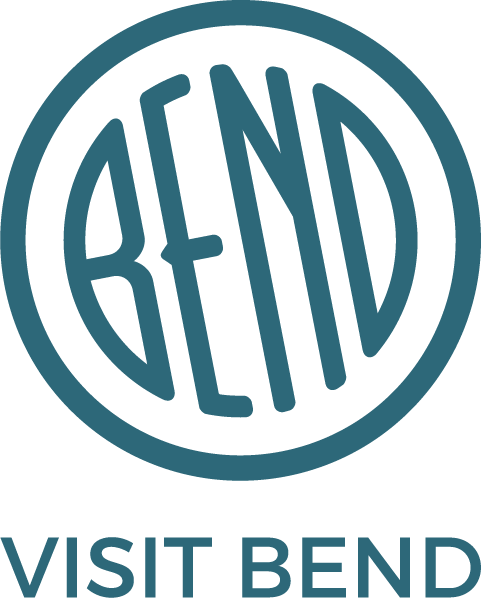 Before you go: Make sure to sign the Bend Pledge online, committing to be a good steward of this special place. Plus, you could win a free trip. For lodging and dining information, head to Visit Bend. Shellie Bailey-Shah is the founder and editor of KidTripster, an online family travel magazine that informs and inspires families traveling anywhere in the world. 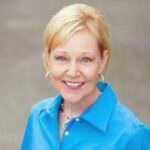 She lives with husband and sons in Portland and has logged thousands of miles behind the wheel of the family's RV.